I had a hard time putting together my thoughts for this novel. I actually still don't quite know what I think of it, but I think that also means that this story is important to read and its complexity means that you can't just throw off a breezy two paragraph review and call it a day. 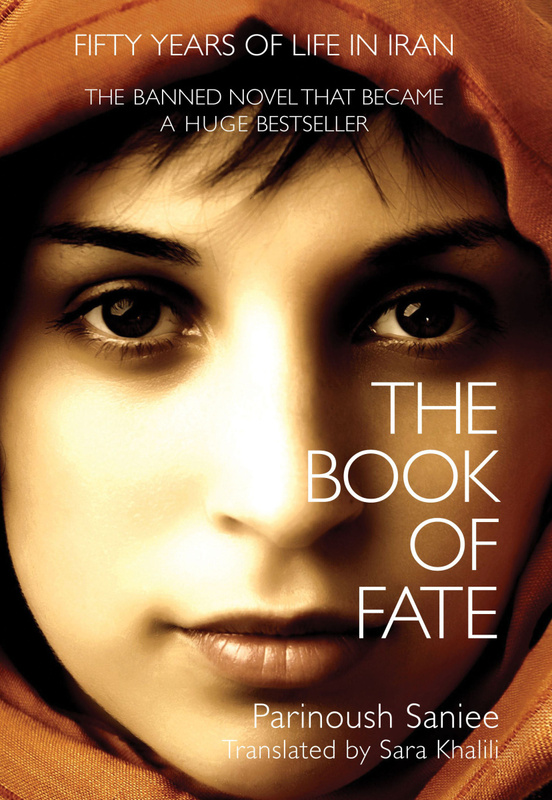 Knowing absolutely nothing about Iran and Muslim culture, The Book of Fate was a learning experience for me straight from page one. The best novels are ones that can immerse you into experiences outside of your own and this book is a prime example of this and a credit to its author. Banned in Iran, The Book of Fate nevertheless became a bestseller and is a searing tale of what life was like for women in the tumultuous times of the revolution. Beginning in the 1960s, The Book of Fate follows the life of young Massoumeh, who has recently moved into Tehran with her family from rural Qum. Bright and ambitious, Massoumeh excels at school and receives nothing but ire for it from her jealous brothers and willfully oblivious mother, who would rather she invest in sewing, over books. Despite her family's pressure, Massoumeh perseveres with her education thanks to the dotage of her father and even makes some friends. Life is pretty good until an innocent encounter with a neighborhood boy, Saiid, turns her world upside down. Before Massoumeh and Saiid can even have a proper conversation, he is attacked by Massoumeh's brothers and shamed out of the city, while she is beaten severely and locked into her room. Almost driven mad with despair, Massoumeh somehow clings to life and is quickly married off by her family to alleviate her "shame." Although marriage might seem like a death sentence at first, Massoumeh realizes that her new husband is actually not the monster she feared, but actually a progressive Communist who encourages her to go back to school. Freed from her family's shackles, Massoumeh begins to blossom again and to grow in affection for her husband. That respite soon ends though as her husband's Communist leanings become more than just talk. Life for Massoumeh is a constant rollercoaster between peaceful highs and back-breaking lows. Throughout the book, author Saniee continuously hits home the fact that Massoumeh's life is thrown upside-down by the whims of men, with her left holding only the responsibilities and the consequences. Somehow Massoumeh survives it all, pursuing her education while raising a family as a single mom. Through the kindnesses of strangers and her own sheer will, Massoumeh dedicates her life to her two sons and daughters and tries to teach them the painful lessons she has learned. Finally, in the closing chapters, Massoumeh seemingly gets a break. Her childhood love makes a sudden return and Massoumeh is finally offered a chance at lasting happiness. However, in one of the cruelest twists ever, there is one last obstacle and Massoumeh must make a decision that will forever seal her fate. The Book of Fate was a fascinating read. I can't comment on how accurately it depicts the historical events it takes place within, but I can gain insight from Saniee's portrayal of a woman and mother. The Book of Fate is a story of a woman's strength; it's a strength that is unique to women and is the ability of women to suffer in silence and to endure through the most terrible of situations. Sadly, it's a quality that is too often ignored in society but should be held as heroic as any bold soldier. Ultimately, the question that rose to my mind in The Book of Fate was the question of how much should a woman sacrifice for for the love of others. Does becoming a mother and a wife mean that we should lose all sense of ourselves? Will women always just be sacrifices to the altar of cultural expectations? It's easy to say from a privileged Western view that Massoumeh is weak and caught in backwards religious thinking, but I don't think that's what Saniee meant to say. Surrounded by people who only think of themselves and their aims, is it really weakness that leads Massoumeh to act differently, or is it strength to shoulder that which no one else will do? You could write off The Book of Fate as a tragedy, and it is, but it is also a story of triumph, of survival and an intimate tale of what it is to be a woman.